In 2011 IndischHistorisch.nl agreed to be partners with the American based The Indo Project. The mission of the project is to preserve Indo-culture in the English-spoken regions. An important aspect is the collecting of family stories, photographs and other media about the Indo past. 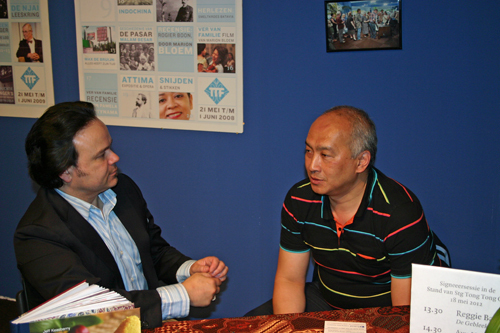 Since 2011 The Indo Project and IndischHistorisch.nl made some steps in further collaboration. Board member at large Jan Krancher sent some personal documentation maybe useful for publishing. In 2012 member of the board of directors Jeff Keasberry published on IndischHistorisch.nl his article Dutch-Indonesian Cuisine: Our Shared Culinary Heritage (August 2012). In the meantime IndischHistorisch.nl is working out an English written timeline of Indo history meant for younger generation Indos who do not master Dutch language. Petitioning The Japanese Embassy in Washington D.C. The Japanese Embassy in Washington D.C. Here is our open letter to filmmaker Angelina Jolie in which we, The Indo Project (www.theindoproject.org) initiate a counter petition as an answer to the petition started in Japan, to ban Angelina Jolie’s movie UNBROKEN. We encourage people to sign to stop the continued effort of Japan to deny and censor its war record and crimes. Prior to the release of your movie Unbroken which depicts, among other things, the circumstances of a Japanese POW camp, the news broke that your movie might be banned from being distributed and screened in Japan. Japanese nationalists have already collected 8,000 signatures in a petition to ban the movie, and Hiromichi Moteki of the Society for the Dissemination of Historical Fact has questioned the movie’s credibility and called the film immoral, racist and demonic. We at The Indo Project (www.theindoproject.org) question Mr. Moteki’s sources and hope he’s aware of the list of the many war crimes the Japanese committed in the period 1937-1945. Has he ever read up on the Nanking Massacre and the other massacres, the building of the Burma railway line or the Bataan Death March? Official Japanese war crimes include torture (including water boarding), use of chemical weapons, forced prostitution (comfort women) and forced labor (romusha). WWII statistics of casualties are tricky and controversial but if we have to mention one number, Mr Moteki can check the US Navy Department Library for himself. While the total number of American service men (93,941) in German POW camps experienced a 1% death rate, US service men (27,465) interned in Japan and Southeast Asia, had a 38-40% mortality rate. We at The Indo Project all had relatives in Japanese internment camps and life was exceedingly harsh: starvation, excruciatingly long train rides in box cars without food or water, withholding of food and medication, forced labor, torture, death marches— we have heard it all in our families. A denial of the war crimes represented in the movie is a denial of the atrocities perpetrated against our family members who rest in war cemeteries and mass graves all over Indonesia, killed, directly or indirectly, by the Japanese army. The war in Asia has been underrepresented in movies and books, and sadly, generations of Japanese schoolchildren still may not know what their grandfathers did in the war as Japan’s role in WWII has been denied and pushed under the rug for generations. This denial has now been compounded by name calling, which, in our view, is compelling testimony of how nervous some Japanese factions are about being found out in a movie that shows the excessive cruelty of some Japanese officers. By banning the movie in Japan, the Japanese miss yet another opportunity of educating their children about the Japanese war record. We applaud you, Mrs. Jolie, for pointing your cameras at the war experience in Asia. By doing so, you honor our grandparents and fathers and mothers who perished in Japanese internment camps and prisons. Your hero in the movie, Louis Zamperini, survived to tell his tale to Laura Hillenbrand and you, and in the telling of his story, it has become our story too. We want to endorse your movie by starting a counter petition, signed by the survivors (POW’s, civilian internees of the Japanese camps) descendants and other family members or friends of those who could not sign for themselves because they died under the Japanese regime. We petition Japan to stop all forms of censorship and show the movie, and we commit to supporting the movie by taking family and friends to see it together. Prachtig heb ik gevolgd en poekoel troes voor de Indo club Soerabaja.